Hello! 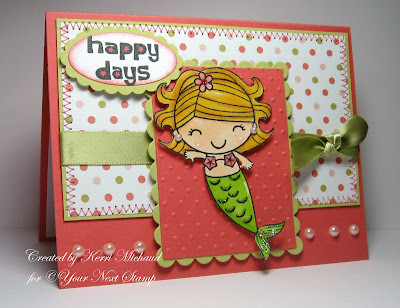 In honor of my happy day I decided to use this adorable Your Next Stamp set called Happy Days Mermaid for today's Sketch Challenge on SCS : ) I just think she is the cutest!!! I also pulled out some PTI paper which I need to get a lot more of now lol! I used Berry Sorbet but the color is coming up a little bright in my picture compared to the real thing : ) Everything is pretty self explanatory on this one so I will leave the full recipe below. Thank you so much for stopping by! Gorgeous Kerri!! Love all the delicious colors and the stitching. Congrats on the new dt Kerri!! You will be a magnificent addition to that team. You cards and project are always so inspiring!! I agree the SU policy is ridiculous and I think they will be losing a lot of business because of it. Your card is too cute!! I love the mermaid and that paper is beautiful! Fab coloring and the glitter is the perfect touch!! Wooo - crossing over to the Papertrey side - ha! That's too bad about the whole SU! thing...seems really wacky...and totally unreasonable and I'm not even in the SU! world. Congrats on the new DT - - you'll be a great asset to them. Totally adorable! Love that mermaid and can't wait to get my order so I can play too! Lovely stitching and additional details you added on the cute mermaid. Isn't she adorable?! awww Kerri this image is just the sweetest!! Wow girl your card is absolutely ADORABLE and the colors and your take on the sketch rock!!! So cute Kerri! Such pretty DP's and colors, and I love the stitching and those pearls! I love this card! Look forward to working with you! LOVE that cute little mermaid!!! Lovely colors, coloring, and design, Kerri!!! Congrats on the dt gig!!! She is so cute! Love the colors, the papers, your coloring - everything about this happy card!